TahNibaa Naat'aanii was born to the Hooghan Lání (Many Hogans People-maternal clan) and born for Ma´iídeeshigiizhinii (Coyote Pass People-paternal clan) in Shiprock, New Mexico, on May 5, 1967. Attending kindergarten in Ft. Defiance, Arizona, is among her earliest memories. 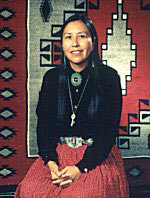 At the age of ten, her father and mother moved to her current home: Table Mesa is approximately twelve miles south of Shiprock, New Mexico. Although television and other technologies were available to TahNibaa, her mother was very strict about letting her indulge in such entertainment. Sarah H. Natani, a nationally acclaimed weaver in her own right, wanted her daughter to learn how to weave and to have knowledge of important Navajo traditions, and a sense of history about her people and culture. Trips to Toadlena, home of her paternal grandparents, where TahNibaa played with her "lady nalli Sarah's" (paternal grandmother's) red wool are fondly recalled, "my grandmother encouraged me to know the wool." And know it she did, since she would card endless wool "roll logs" for her mother in the evenings. "I did this primarily because fragments of wool would stick to my skirt and I could go outside and twirl and twirl to get it off. I just loved twirling that skirt." One day, at age seven, TahNibaa returned home from school and a loom was set up for her. It was time to learn to weave. Under protest, TahNibaa began what was to become one of the most important lessons of her young life. She learned to weave from practicing at the loom and the only thing her mother would let her weave were stripes and occasionally a diamond and rectangle because "it was important to learn process first." She sold her first rug at the age of ten and discovered she learned she loved to work with her hands. TahNibaa's weaving continued through high school, but at times she found it difficult to live in both the biligaana and diné'e worlds. Recently discarding a prestigious position as a bio-scientist, she is currently pursuing weaving full-time. She weaves regional designs from the Crystal, Two Gray Hills, Burntwater, and Wide Ruins areas of the Navajo reservation. Experimentation with creating historic second and third phase chief-style men's and women's shoulder blankets and re-instituting the wedge weave technique helps to ground her work in the past traditions of her people. Always eclectic and creative, TahNibaa also weaves pictorials and manipulates a six-heddle warped loom to create the twill-style float weaves. Her rugs and tapestries are recognized at such shows as the Heard Museum Fair, Eight Northern Pueblo Arts and Craft Fair, the Gallup Intertribal Ceremonial, and the Santa Fe Fiber Art Show where she has won several awards. 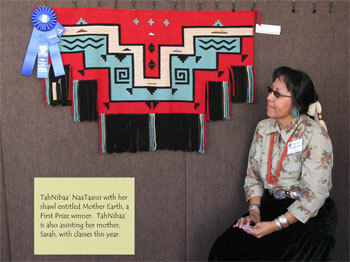 Tah Ni Baa Natani's fingers easily demonstrated spinning the Navajo three-ply with the light-colored wool. "What our ancestors did is so ingenious," Natani said as she completed the three-ply with one string and a drop spindle. "It's our responsibility to learn that and remember that." Roy Kady, Navajo master weaver, co-founded a casual, monthly weaving gathering called the Spin Off where Navajo and non-Navajo weavers can gather, socialize and support each other. Natani, a fulltime weaver and shepherdess from Table Mesa, N.M., is a co-founder and organizer of the Spin Off gathering - a casual gathering of Navajo and non-Navajo weavers and spinners. Natani and her co-founder and weaving colleague, Roy Kady, hosted a third Spin Off gathering Saturday at the Teec Nos Pos Community School. "Part of this group is to teach anyone to spin and weave," Natani said as she began to spin a mushroom-colored bundle of hand-processed wool. "Someone could hand spin their own hair-tie, there's a lot to be taught at gatherings like this. "There are different ways of preparing wool," Natani said. "We want to form a guild and a support group so it's done easier." During the gathering, participants learned how to make felt from master weaver Kady, a full-time agro-pasturalist. "He's a felter," said Natani as she looked over at Kady who was helping Lillian Trujillo, 78, of Shiprock, and Ida Barber, 66, of Fruitland, N.M. card their wool with the drum carder. Spin Off participants were also introduced to the spin wheel. Navajo elder Rita Jishie, 75, of Tsaile, Ariz., learned how to used the spin wheel that was imported from Holland. Jishie, a life-long weaver, spun a bundle of brown hand-carded wool as fellow weaver Beverly Allen observed. Allen, a Diné College extension agent, brought a van of Tsaile community members who have an interest in weaving and spinning. 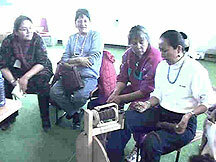 Allen teaches weaving to area residents. Long ago, Navajo ancestors would get together, card, spin and weave, according to Kady. "That's how they would socialize everyday," Kady said. "The goal of the Spin Off is to bring communities together, that's how we socialize." Natani who has been weaving since she was seven years old, said she "got serious" about weaving more than five years ago. "Weaving has been going in and out of my life," Natani said. "I started on a different level about five years ago." Kady is open about weaving because of the positive influences of his community. He was given his mother's weaving tools more than 17 years ago and has been weaving full time. Kady, from the Goat Springs portion of Teec Nos Pos, uses a lot of Navajo methodology in his myth rugs. His weaving reflects aspects of the Navajo creation story or the spirituality of the Navajo people. He has sold his rug creations to collectors and museums but said he doesn't weave for the money or notoriety - he weaves because he loves it. For more information on the monthly Spin Off gatherings call Kady at 928-656-3498 or e-mail at roykady@dinewoven.com.